Goodness, she’s so cheery, she’s going to bring everybody else down! Well, OK, maybe not everybody. Still, she is inhumanly cheery. … To me, this seems like she has the perfect personality (fake or not) for a job in Tactical Eliminations (aka Black Ops Assassin). What I mean is, imagine if you’re law enforcement and someone just got killed, and you encounter this bright and cheery girl among the people passing by – would you suspect her of being the culprit, over any of the others? Why is it the overly happy one are creepiest. …Ah. That explains a few things. Y’see, I have a hard time with names (I think I’ve said this before here, so sorry about repetition) and I fully haven’t caught onto which person in the agency does what yet. When the brown-haired lady talked to Abby about someone switching into an office job, I assumed that the goth girl standing there was the girl moving in and that her comment meant that she liked Abby (who she would be working with) already. Thus my ‘are we sure that’s the same person?’ comment in the comic before the current one. I can understand that. I had to go back and look up the Doctor’s name. That’s the down side of having a large cast of characters. 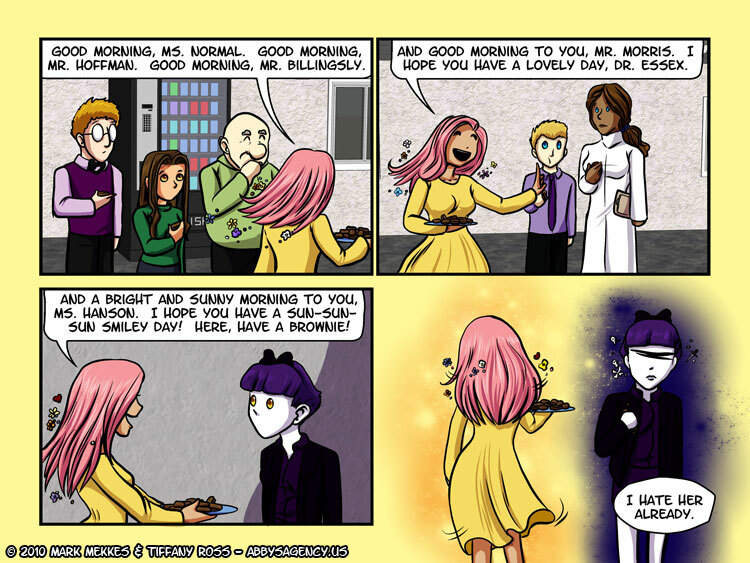 Am I the only person who sees Plague, I mean Kelly’s emo sparklies battling with Agent Doorn’s happy sunshine sparklies? And am I the only person who sees Agent Doorn’s happy sunshine sparklies winning the battle?